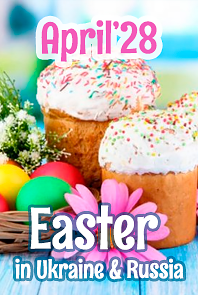 Easter is one of the most widely celebrated holiday seasons across the world. It is the oldest of the Christian festivals and is celebrated approximately at the end of the first quarter of the calendar year although its date changes depending on the lunar cycle and differs each year. So, Catholic Easter (in the USA, Canada, Great Britain, France, Italy, India, Australia and in many other countries) will be celebrated on Sunday, April 1 and Orthodox Easter (in Russia, Ukraine, and Belarus) will be celebrated on Sunday, April 8 in 2018. Dear friends, we congratulate all our customers on this wonderful holiday and wish you Happy Easter! It is the time for celebrations, for coming together with friends and a season of love and of peace. Don’t forget to check our new Easter Delivery propositions and choose the best one for Her. It will help to create an Easter Mood for your Sweet Lady from TopLop.com! Let this Easter renew your faith, cheer up your spirit and fill your heart with joy!